Check-in by arrangement. Please contact us 24 Hours prior to check-in with your ETA. Early check-in or late check out may be possible. Contact the managers on 0467 237 636. Extra Guests $50 p/p p/n. Infants in a cot & under 2 years $25 p/p p/n Port-a-cot avail.by arrangement (incl in rate). Pets permitted strictly by prior arrangement $40 one off fee. One garage space per unit. Visitor parking by arrangement. 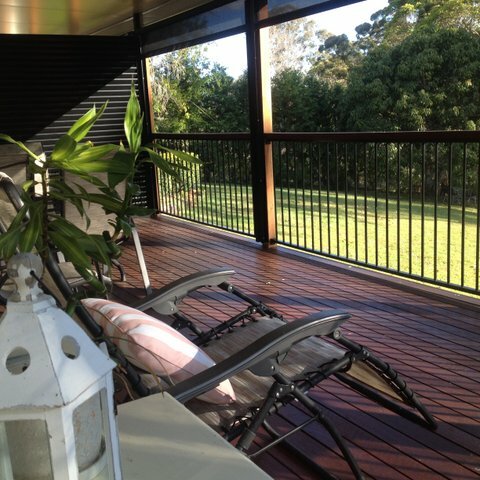 For more information on Sunshine Coast Accommodation Terms Conditions give us a call. Joy made our weekend trip away to celebrate my wife's birthday and anniversary, an amazing experience. We felt like an honoured family member more than a guest and the welcoming display she presented on arrival in our room was perfect! My husband surprised for Valentines me with a night away at Mapleton Falls Accommodation in the Sunshine Coast Hinterland. It brought me to tears, he per-arranged lots of beautiful surprises for me with the manager. Flowers and Rose petals in our initials, handmade chocolates, champagne, an afternoon massage in our apartment and dinner at a charming restaurant. Our weekend was spent caring for people who care for family members with a disability and Joy catered to our every need. Her gentle and caring nature allowed us to feel welcome and valued - what a very special weekend.